Wake the town! As I would say… Well, not I really, but U. U-Roy, to be exact. In his long and fruitful life, Mr. Ewart Beckford has created history. Not only by recording countless singles and albums or by being awarded the Jamaican Order of Distinction, but by shaping and pioneering a whole genre. It was his unique toasting style that contributed to the growing popularity of King Tubby's first attempts at Dub in the late 60ies as well as influencing the very first MCs and Rappers of the HipHop era, and singles like Wake The Town, Rule The Nation or his version of The Paragons' Wear You To The Ball were a huge success for producer Duke Reid. After more than 22 releases, U-Roy is now back with Talking Roots, his fifth collaboration with London's Ariwa Sounds. Produced by none other than the Mad Professor himself, the release guarantees a fat, dubby sound, based on fine instrumental contributions by the likes of Horseman, Sly Dunbar, Lloyd Parks, Steel, Dean Fraser and the Roots Heritage Brass. A well-balanced choice of new tunes and felicitous make-overs of older hits, like Sister Aisha's Wait A Minute (here called 3 Minutes Of Talk) and The Tide Is High, ensures an interesting listening experience for both occasional Reggae listeners and down-to-the-bone Roots fans. The latter will especially enjoy the social commentary so typical for this well-informed artist in Repatriation which touches on the questionable immigration policy of Donald Trump, also displayed in the exceptional cover-art-work. There, you'll find an illustration for Bitter Nut as well, the lyrics of which talk about the cola nut consumed in West and Central African countries as a traditional stimulant. More serious issues are tackled in Black Man (an adaptation of the well-known Can't Keep A Good Man Down) and Mother Of Civilisation, telling us how desirable it is to be yourself no matter what you've been through. "Every part original! No false parts, from head to toe." Of course, humour has its place as well here. With a wink, Teacher Morris talks about a school boy romance, while Jamaica invites tourists to the sweet island (including critical comments by Natasja) and Dog And Bone warns you to not be too greedy. A sonic highlight is Brimstone & Fire with its deep deep Reggae beat and, once more, the crystal clear vocals of Aisha. In an almost Gospel-like style, Nadine Sutherland adds her voice to the album in Come Follow Me, a drum-roll-dominated Zion-hymn. 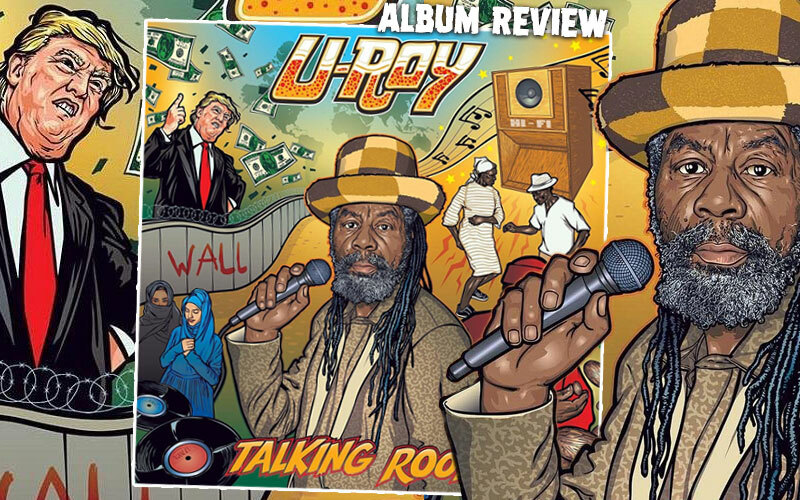 With Talking Roots, U-Roy proves that he his still one of Jamaica's leading vocalists out there, despite his impressive age of 76 years. And not only does he still record and release, but he's touring, too! Make sure you catch him on one of the dates in UK and Europe this summer… as I would say!